Storm season is already starting! Will emergency teams know how many people and pets live in your house? Likely not—and they will risk their lives searching for victims. Help them help you. Post a “Rescue” window card near your front door. Sunbear Squad has a unique design that includes both people and pets. Click to download. Do it today—share with family and friends too. Our rescue card (pictured at right) provides emergency personnel, such as firemen and police, the most important information about your home: the lives inside it. Our card tells the numbers of adults, children, and seniors, as well as dogs, cats, rabbits, bird cages and fish tanks. Of course rescuers might not be able to take action to save all lives in the home, but if they know about them all, the likelihood increases that more can be saved in an emergency. Remember, many emergency personnel want to save animals too, if it can be done safely. Download the free file at the link above, and print it on white card stock. Speak with a neighbor about including their phone number on the window card, and offer the same for their card. 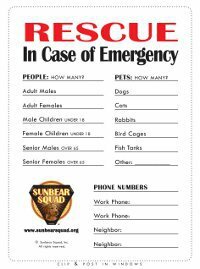 The file also includes a Sunbear Squad Wallet Card, so you can keep emergency numbers handy in your wallet (or enter them in your phone). Print extras for neighbors, family, and friends as a caring and potentially lifesaving gesture.